Trustworthiness and conscientiousness are two elements of self-regulation, or self-management, which in turn is a key component of emotional intelligence. They are, in effect, almost two sides of the same coin because both are about acting with integrity and in line with your values. People who are trustworthy and conscientious are reliable. If they say that they will do something, then you know that they will do so. conscience n inmost thought: moral sense: scrupulousness; conscientious regulated by a regard to conscience. In other words, you can rely on trustworthy and conscientious people to do the right thing, guided by an inner moral sense of what is right. 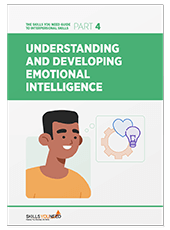 Daniel Goleman, the author of several books on emotional intelligence, identified certain behaviours related to trustworthiness and conscientiousness that were consistent in those with good emotional intelligence. Trustworthy people act with integrity. Integrity gives them credibility with those around them. When they say that their word is their bond, you know that you can rely on that. Their values are consistent with their actions. They are also prepared to confront those who act unethically and take a stand against unethical behaviour, even if that is unpopular. See our section on Assertiveness for more on this. A group of management students was discussing a team assignment. “Great! Wonderful!” came the chorus from the rest of the group, apart from one of the women, Amy, who paused, then spoke up. For a moment, the group hovered on the brink of anger. It was Steven, highly emotionally intelligent, and always able to come up with solutions, who made the breakthrough. “How about I talk to the tutors, see if they’re OK with it?” he asked. Once again, there was a chorus of approval, but this time Amy was able to join in. She had stood up for what she believed was right, but was prepared to accept a solution that checked the integrity of the proposed course of action with those who would be able to make a definitive judgement. Our page on Goodness – Using your Moral Compass explains more about how to develop that ‘inner voice’ that tells you right from wrong. Our page Learning to Live Well gives you a framework for developing your moral compass, and living a more ‘virtuous’ life. Both these will help you to become more trustworthy. Conscientious people keep their promises, and act on their commitments. If they say that they will do something, then you know that it will happen. Conscientious people hold themselves accountable for their actions. They are also careful and organised, so that they know what they can achieve and by when, and therefore do not make unrealistic promises. If you struggle to get and stay organised, then you may find it helpful to read our pages on Time Management and Organising Skills. The crucial quality which conscientious people all seem to share is being able to control their impulses. They can get things done because they are very self-disciplined, making sure that they do what needs doing without getting distracted. See our page on Minimising Distractions for some hints to help you. Conscientiousness is highly valued. But without empathy, and other social skills, it can lead to problems in social groups. For example, conscientious people set themselves very high standards, and often find organising themselves easy. They are therefore inclined to be judgemental about those who may struggle to turn up on time, or keep their promises. Conscientiousness can also take the form of rigid maintenance of standards, which can damp creativity. If you tend towards being very organised and pride yourself on your ability to achieve, perhaps you may like to look at our page on Creative Thinking Skills to ensure that you are not being too bound by your determination to be reliable. It is important to find a balance between maintaining personal standards, and a careful and very human understanding that everyone falls short sometimes, even you. In many jobs and areas of life, there is a certain ambiguity about what is right and wrong, and particularly what is expected. However, research shows over and over again that those who act in accordance with their inner moral compass are more likely to be respected, and to be happier with their lives, than those who allow themselves to be pushed into doing something that is not consistent with their personal values. Integrity is crucial for credibility: without it, we cannot be relied upon, and others will quickly learn that.